Texas Adaptive Aquatic Sports, and the Lake Houston Sports and Recreation Foundation (LHSRF) have teamed up to celebrate Lake Houston. Enjoy a “Funky Good Time” with live music from Jerome Batiste and the Zydeko Players; Meet the City of Houston’s Lake Houston Patrol; enjoy great food; fishing for all ages; bounce house and games for the kids; a twelve and under fishing contest; boater water safety inspections; The Texas Parks and Wildlife will be on hand to demonstrate, and give tours of the vegetation habitat ; and more. Come on out and enjoy a day of family-friendly fun at the lake – $10 for adults and $5 for kids under 12 (lunch included). LHSRF would like to remind everyone to bring lawn chairs, fishing pole, life jackets for small children if they will be in the water, and a cooler with your favorite beverage. Schedule of events are as follows . Zydeko music and fun from 3pm to 7pm. 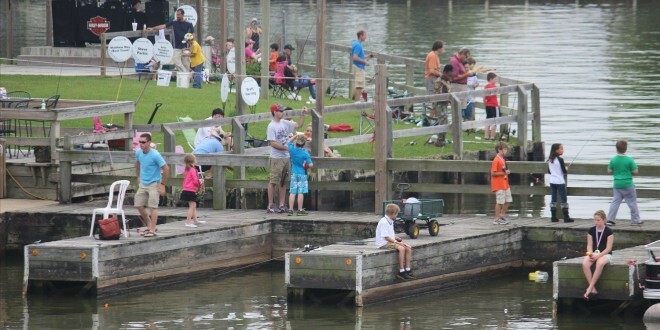 Visit www.lakehoustonday.com for more info. The Lake Houston Sports and Recreation Foundation was formed by members of the community interested in increasing public awareness of the benefits a major lake brings to our community; to create a fish stocking program that enhances the genetic makeup of a fish population; implement a native plant restoration program to improve the habitat; and other improvement projects on, and around the lake. Texas Adaptive Aquatics (T.A.A.) features an outstanding adaptive water skiing program that allows people with physical and/or mental disabilities the opportunity to discover the thrill and excitement of water skiing, sailing, and kayaking. T.A.A. founded in 1989 and incorporated in the State of Texas in 1990, is a non-profit sports training program for children and adults with disabilities.